How do I add an exhaust fan to an old attic? Our house's attic retains a great deal of heat during summer. While we now have a good layer of insulation between the attic and the rest of the house I wonder if it would be worth it to add some kind of exhaust fan. We live in a mid-Atlantic state so we have to contend with both 100°F summer days and 0°F winter nights. The house still has the original slate roof so adding a typical roof-based system isn't an option. There are three small circular windows that provide some air flow, but not much. My thought was to install a fan in one of those windows to force a cross breeze during warm days. Is this likely to save us any energy (given that the fan will have to draw some power)? 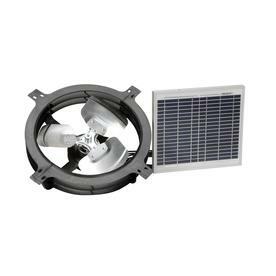 Are there options for solar-powered small window exhaust fans out there? The solar panel is on a cord, so it can be installed in the most sunny area while the fan sits in the gable. The Gable-Mount Solar Vent is an exciting alternative to traditional attic ventilation. That's because it is powered by a solar panel that collects energy directly from the sun and converts it into electricity -- naturally -- to power a durable, high efficiency 24-volt DC motor. As a totally solar-powered solution, it's also environmentally friendly. The best installation feature is that the fan requires no electrical hook-up. That means no electrician and no complicated wiring is required, making the installation of your attic fan fast and easy. It mounts in the gable end of the home, behind a decorative shutter (not provided, see below). The solar panel comes with brackets that allow for mounting on the roof. The solar panel collects energy throughout the day under direct sunlight and converts it into "free" power to operate the fan -- providing ventilation during daylight hours, when it's needed most. It creates up to 800 cubic feet of air movement per minute to remove uncomfortable heat in the summer and damaging moisture in the winter. And, the solar panel is wind-, hail- and impact-resistant to stand up to the elements. There are powered gable vents you can install (cut a hole thru the side of the attic, or use the already provided gable vent) and they're fairly inexpensive. The best way to remove heat would be to use those small windows for makeup air and use a separate powered vent to exhaust the hot air. Even a smallish AC powered gable vent fan is going to pull 400 watts - so you can see how this gets expensive. There is a combination solar panel/attic vent kits which uses a DC motor but I'm not sure about the effectiveness. It seems to be rated fairly low in terms of air volume moved (800 CFM vs 1200-1600 for a 110v powered vent fan). Exhausting your attic will definitely save you energy as you're removing a huge heatload from your air conditioning - the superheated air in your attic. Consider using a solar panel to power the fan. If you only need it running when it's hot (the sun is out) then it makes sense to use solar panel. It can run all day long without incurring energy costs. Not the answer you're looking for? Browse other questions tagged energy-efficiency attic or ask your own question. Gable Vent Fan to Make Usable Attic Storage Space - Useful or Trouble? How to create a conditioned attic? vent fan blowing into attic. Good or bad? How to deal with the trapped air in a loft attic?